Ben Hudson’s unconventional football journey came to a halt when he underwent shoulder surgery midway through the 2014 season. Thirty-five year old ruckman Ben Hudson will be moved onto the club’s long-term injury list after being sent in for surgery on his injured shoulder. Veteran rookie Ben Hudson is looking to assist other school, local and TAC Cup ruckmen who are looking to make their way in the big league. A footballing journeyman, 2014 marks Hudson's 11th in the AFL. Collingwood is his fourth club, more than 160 games on from his debut for the Crows back in 2004. 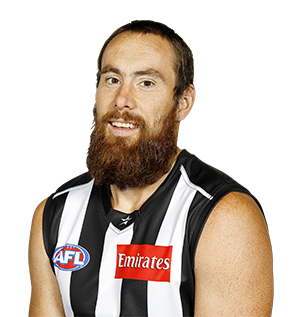 Hudson has been a highly valued team man wherever he has played, with his distinctive beard and ferocious attack on the board masking an affable personality. He played seven senior games in 2013 and performed strongly across his 10 outings at VFL level where his nous and leadership helped fast track the development of young ruck tyros Brodie Grundy and Jarrod Witts. Hudson will again be a nominated rookie in 2014, meaning he will be eligible to step in should either of Grundy or Witts require at break during the season. Hudson’s career has had more twists and turns than he’d care to remember but surely not even the man himself ever thought he would end his career in Collingwood’s Black and White stripes. As strange as it seemed to some onlookers, the 34-year-old was added to the Magpies’ rookie list in December with the additional responsibility of fast-tracking the development of the club’s young ruck stocks. His renowned competitiveness saw him quickly establish himself as one of the VFL Magpies’ most important players and it wasn’t long before he received the call up into the senior side. Hudson’s Magpie debut came in wet conditions against Hawthorn in round three when he filled in for the injured Darren Jolly. Not surprisingly, Hudson excelled, recording 25 hitouts, five clearances and the 19th goal of his career. By the time he had rucked in the ANZAC Day loss to Essendon, Hudson had played in front of a total of 247,577 people – an average of 82,525 spectators across his first three games for the club. To put that into perspective, in his 161 games at Adelaide, the Western Bulldogs and Brisbane, the biggest crowd he had played in front of was 78,245 for the Bulldogs against St Kilda in the 2009 Preliminary Final. He slipped out of the side when Jolly returned but continued to serve nobly in the VFL, highlighted by his 24 hitouts in the thrilling win over the Northern Blues in round eight. When Jolly was sidelined with knee surgery, Hudson got another taste of the senior action in rounds 14-17 but didn’t reappear after the loss to the Suns. He remained in the frame for a senior call up as the year wound down, regularly featuring as an emergency in the lead up to September. The big man’s leadership and commitment to the cause won the hearts of his younger VFL teammates, some of whom were still in primary school when he made his AFL debut for Adelaide in 2004, and his presence clearly made them walk taller out on Victoria Park. Joined the club as both a rookie and ruck coach after coming out of retirement for the second time at the end of 2012. Will mentor the Pies’ bevy of young talls as well as providing an experienced back-up ruck option should injuries occur after playing 18 games in his one season at Brisbane. Interestingly, that season yielded his first Brownlow votes (for his 21 disposals and 21 hitouts against Gold Coast in round 17). 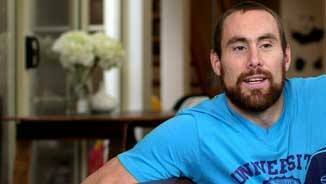 Had retired from the Bulldogs, but was snapped up in trade week as a back-up for Matthew Leuenberger. Eight seasons with the Crows and Bulldogs had shown the veteran to be one of the more competitive and combative ruckmen in the AFL and was recruited to act as a mentor to Brisbane's young ruckmen. Played 17 games and averaged 22.53 hitouts in his final season at the Whitten Oval. The veteran ruckman continues to improve with age, enjoying the best of his six AFL seasons, having more disposals, hitouts and impact than ever before. Was sixth in the best-and-fairest and was perhaps unlucky to miss the All-Australian squad. One of the few Dogs to excel in the Qualifying Final loss to Ciollingwood, when he had 19 touches and 31 hitouts to eclipse Pies premiership hero Darren Jolly. Seventh in the AFL for hard-ball gets, he won the inaugural Brad Johnson Award as the Bulldogs' best team player. The former Adelaide ruckman enjoyed the best of his five seasons at AFL level, playing 24 of a possible 25 games and averaging 13 disposals and 3.4 tackles. Doesn't dominate ruck duels (averaged 16 hitouts) but provides an aggressive contest and great physical presence, being second at the Dogs for hard-ball gets. Produced a strong finals series, with his best performance being a 22-disposal effort in the Semi-Final win over the Brisbane Lions. Made a great start to his career at the Whitten Oval in 2008, with his strong work around the stoppages helping the Bulldogs to second place on the ladder at round 15. However, like some of his teammates, Hudson's form tapered towards season's end. Returned to near his best form in 2007 after sitting out the previous year after a knee reconstruction. When Hudson's contract negotiations broke down with Adelaide, the Bulldogs were quick to pounce on the respected ruckman. Hudson returned from a knee reconstruction in late July and played out the season in the SANFL with North Adelaide as the Crows charged towards the Preliminary Final. Any thoughts of him being eased back into the senior line-up in 2007 were quickly dispelled when fellow ruckman Rhett Biglands ruptured his anterior cruciate ligament in the Preliminary Final loss to West Coast and veteran ruckman Matthew Clarke announced his departure soon afterwards. Was quickly establishing himself as one of the best tap ruckmen in the competition when he seriously injured a knee late in the season and had to undergo reconstructive surgery. As a result, he missed all three of Adelaide's finals matches. Plucked from VFL club Werribee late in the 2003 National Draft, he proved himself a handy back-up ruckman and played 13 games. A courageous competitor at bounces and throw-ins, he is also a strong mark. Rounded out Adelaide's search for talls by being its third pick (No. 58 overall) in the 2003 National Draft. A solidly built ruckman in his mid-20s, Hudson returned to Victoria from Queensland last year and finished runner-up in Werribee's best-and-fairest award in the VFL. Had previously played senior football for Mt Gravatt in AFLQ. Traded by Adelaide to the Western Bulldogs in exchange for selections No. 30 (Jarrhan Jacky) and No. 38 (Myke Cook). Traded by the Western Bulldogs to Brisbane in exchange for selection No. 70 (Luke Dahlhaus, rookie elevation).